No matter what breed your horse is, no matter how young or old he may be, no matter what style of riding you enjoy, it all comes down to soundness. You won’t get far without it. It might be that poor feet or lameness concerns are limiting your horse’s potential, or even interrupting your riding schedule. 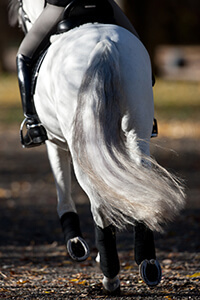 Or perhaps your horse isn’t having trouble now, but you have serious riding goals and don’t want anything to interfere. You may have a shelf full of reliable topical products, ranging from hoof moisturizers and conditioners to sealants, thrush treatments and hoof packing. Those can be extremely helpful, but your horse’s hooves need more. “If you really want to impact the quality of the horse’s hoof, you have to do it through nutrition, not just topical hoof products. You have to start from within,” says Richard G. Godbee, Ph.D., PAS, Dipl. ACAS. Godbee is the Nutrition Director in the department of Nutrition Research and Development for Farnam, Vita-Flex and Horse Health. Here’s a familiar example of trying to address hoof quality from the outside in. Many old-time horsemen let their water tanks overflow just enough to create a bit of mud around the tank so horses coming to drink get their hooves dampened by the mud. Godbee points out that while you can certainly impact the moisture of the horse’s soles by standing him in mud, or applying a hoof product to help retain moisture, these practices do little to increase moisture in the hoof wall. Overall health — including hoof health — starts from within and works outward. For starters, the horse must be on a good quality, balanced diet and be fed the proper amount for his body condition, age and workload. “We need to remember that in order to ‘feed the foot,’ we have to feed the whole horse. If he’s protein deficient and you feed a hoof supplement with biotin, lysine and methionine, those nutrients will go more for maintenance than hoof growth. You can’t tell ingredients to just go directly to one area that needs help,” explains Godbee. It’s only once you have a balanced nutrition program in place that you should begin to address additional needs, such as hoof quality and growth. That’s precisely what Farnam had in mind when they decided to add a brand new supplement to their popular Horseshoer’s Secret® line. Using the latest research, they developed a totally updated product that provides optimal levels of nutrients known to impact foot and connective tissue health. A long-time horse owner himself, Godbee is the expert nutritionist who formulated the new Farnam® Horseshoer’s Secret® EXTRA STRENGTH Hoof & Connective Tissue Supplement. It not only helps strengthen hooves and encourage growth, it also supports tendons and ligaments. “Horse owners who were feeding Horseshoer’s Secret® Hoof Supplement Concentrate will find this new extra strength formula is a more focused product, as it impacts the foot and supporting structures, which the other Horseshoer’s Secret® supplements weren’t designed to do,” notes Godbee. Horseshoer’s Secret® EXTRA STRENGTH Hoof & Connective Tissue Supplement lives up to its name, containing significantly more biotin, methionine and lysine than Horseshoer’s Secret® Pelleted Hoof Supplement, and more methionine and lysine than Horseshoer’s Secret® Hoof Supplement Concentrate. Biotin is important for supporting the elasticity and flexibility, while methionine adds strength and rigidity to the hoof wall. A flexible hoof is better able to absorb concussion. Overall health, including hoof health, starts from within and works outward. Zinc and copper levels are also significantly higher in the new supplement. Zinc is required for many biochemical reactions in the horse’s body, including the formation of keratin, which is the protein found in hooves. Copper helps maintain elastic tissue, such as tendons and ligaments. This is crucial because, below the horse’s knee and hock, there are no muscles. Soundness and stability depend on the health and strength of tendons, ligaments and bones. Other key ingredients include vitamin C, which impacts the formation of tendons and ligaments and also helps neutralize free radicals. Manganese impacts bone formation. All the trace minerals in Horseshoer’s Secret® EXTRA STRENGTH Hoof & Connective Tissue Supplement are complex, which are combinations of minerals and specific amino acids, making them more bioavailable to the horse. Some horses face more challenges than others, due to rugged environmental conditions and heavy performance demands. Still others can have a genetic predisposition to poor quality feet — something to think about if you’re considering breeding your mare. While every horse can gain an advantage from Horseshoer’s Secret® EXTRA STRENGTH Hoof & Connective Tissue Supplement, horses that need added support can especially benefit. “Even when horses genetically have poor feet, if we feed them properly and use a quality hoof product, we can allow them to do the best they can,” says Godbee. He adds that how fast a hoof grows isn’t as important as the quality of the hoof that is growing. The hoof grows from the coronary band downward. You’ve probably heard that it takes about a year for a horse to grow an entirely new hoof. Godbee notes that average hoof growth is anywhere from ¼ inch to ½ inch per month, so for most horses, it will take approximately 10 to 12 months to grow a new hoof. With this in mind, you can understand why feeding a hoof supplement will take months to see significant results. “To see real results, you need to feed a hoof supplement longer than most other supplements, such as those for joint health and coat condition,” says Godbee. “Expect to feed it for 6 to 8 months before most owners will notice a difference, although a good farrier may notice positive changes before then. Horseshoer’s Secret® EXTRA STRENGTH Hoof & Connective Tissue Supplement was designed to be fed to horses of any age, from weanlings to seniors, and for all breeds and classes. While the product just came out on the market during the summer of 2015, it was in testing and fed to a select group of test horses for nearly 2 years prior. Palatability tests showed that it is highly appealing to horses, making it exceptionally easy to use. Godbee recommends feeding it year-round for best results. Label directions include instructions for both initial feeding amount and maintenance. Farnam and Horseshoer's Secret are registered trademarks of Farnam Companies, Inc.